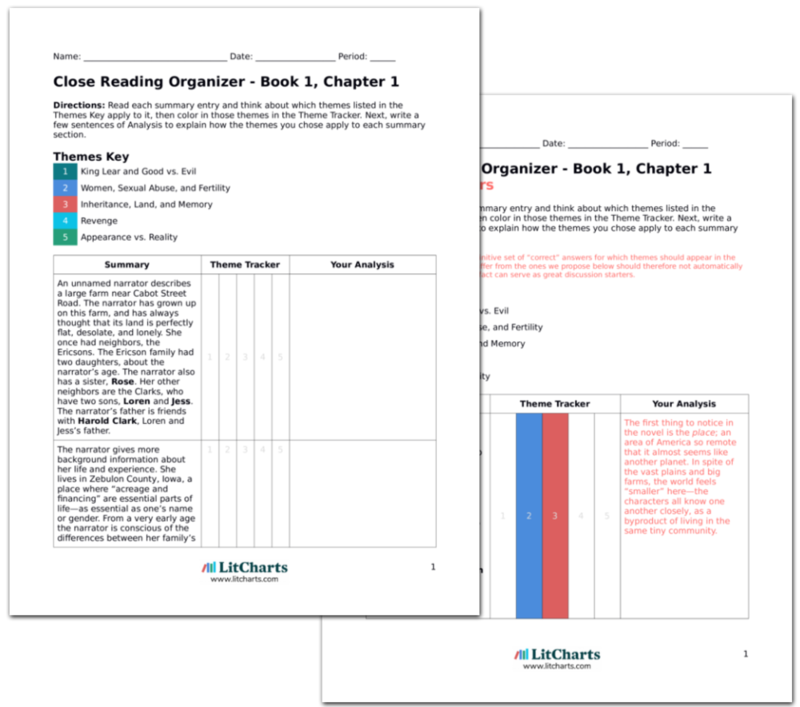 LitCharts assigns a color and icon to each theme in A Thousand Acres, which you can use to track the themes throughout the work. The community is so centered on farmland that even the pastor makes a speech about the importance of the soil. Notice, too, that Ginny tries to get Caroline to “respect” their dad and act like a little girl. Ginny seems so frightened of her father that she wants Caroline to mimic her (Ginny’s) own fears. She can’t conceive of a situation in which Caroline could respect Larry and yet not be frightened of him. Ginny continues to try to convince Caroline to go along with Larry’s plan for a corporation, but Caroline grows angry. She accuses Ginny of tricking Larry into giving up his property in order to get rich quick. Caroline walks off with Rose and Pete, who drive her away from the church. As Ginny watches her sisters drive away, she thinks that Larry’s plan was good, if not for him then for his children. This is the first point in the novel when one of the characters accuses Ginny of being antagonistic to her family’s needs. Ginny is the protagonist of the novel, and so far has seemed like a reliable witness to the novel’s events. So it comes as a genuine surprise when Caroline accuses Ginny of trying to cheat Larry out of his property. An important point to realize is that Ginny, the narrator, would never admit to being greedy, so readers have to study her carefully by paying attention to the way other characters, such as Caroline, treat her. Arn, Jackson. "A Thousand Acres Book 1, Chapter 6." LitCharts. LitCharts LLC, 22 Nov 2016. Web. 19 Apr 2019. Arn, Jackson. "A Thousand Acres Book 1, Chapter 6." LitCharts LLC, November 22, 2016. 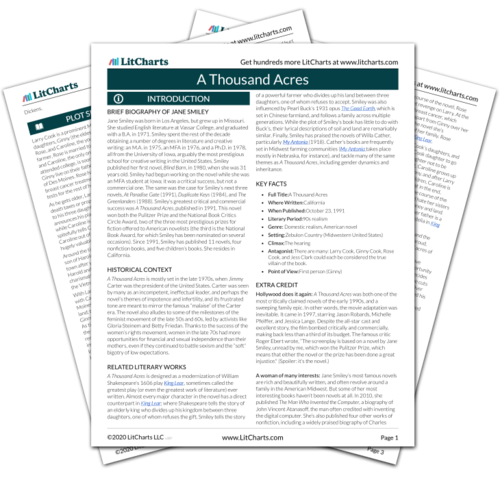 Retrieved April 19, 2019. https://www.litcharts.com/lit/a-thousand-acres/book-1-chapter-6.